I made this card a week or so ago after seeing this card by Wanda Guess and it just kept falling apart, plus my camera was acting up and I couldn’t get a good picture. So today, while my beloved Seahawks were getting their backsides kicked, I reassembled it for the Winter Coffee Blog Hop and added those super cute coffee cups to the antlers! I love it! Bonus the cups don’t keep falling off like the bells did. Thank you for stopping by and wishing very merry Christmas season! This entry was posted in Create & DIY, Link Party and tagged Blog Hop, Card, Christmas, Coffee Lovers, PTI, Tim Holtz. Happy Birthday Amy Blog Hop! I have met many wonderful and talented people since I started blogging nine years ago. (wow that went by fast!) Amy hosts our crafty group whenever we can get together and she really is as nice in person as she seems on the web! She has a wonderful laugh always has a kind word and smile on her face. I am totally blessed by having met her and the other fun, talented and sweet ladies from our group. The card I made was cased from this beautiful card by Nicole Gavaldon. 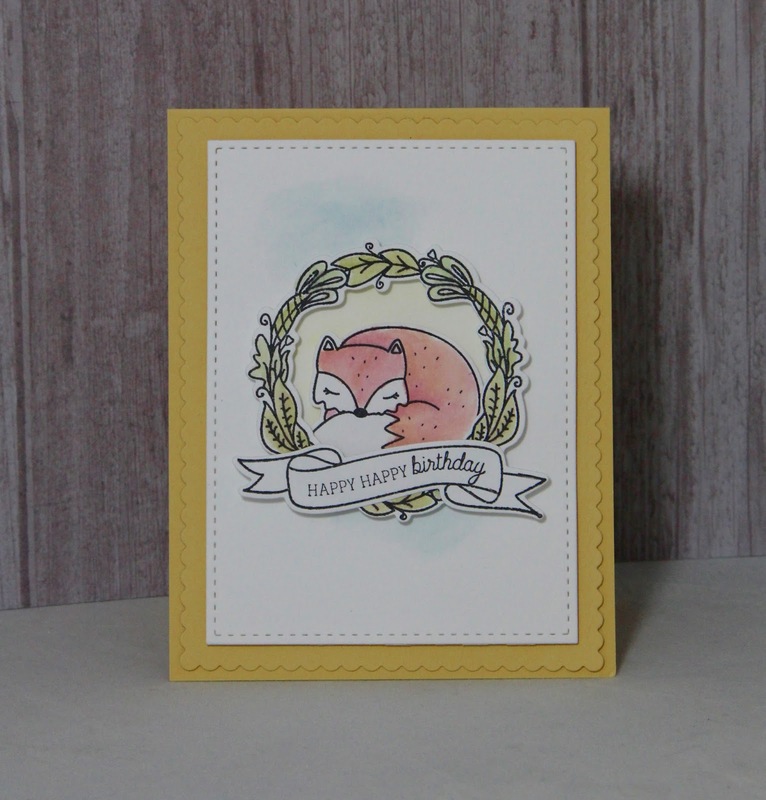 This stamp and die set is Charmed from Mama Elephant (I think that sleeping fox is so cute!) I water colored with Tim Holtz Distress Markers. Please hop on over to see what the ladies have made for Amy! Thanks for hopping along with us and be sure to leave some love along the way! This entry was posted in Create & DIY, Link Party and tagged Birthday, Blog Hop, Mama Elephant, PNW Crafters, Tim Holtz, Watercolor, Wreath.